Fall is here, and by now all of the fall sports are in full swing! As the season progresses and the competition progressively amps up, it is inevitable that the number of sports related injuries will be on the rise. While many of these injuries will occur as a result of an accident, some are also caused by poor training practices, improper gear, being out of shape or lack of proper warm up and stretching prior to activity. Common sports injuries include but are not limited to sprains and strains, knee injuries, swollen muscles, Achilles tendon injuries, pain along the shin bone, rotator cuff injuries, fractures, dislocations and concussions. This is one of the hardest rules for most athletes to adhere to. We spend so much time in the off season preparing in the weight room with a “no pain, no gain” mentality, which can be a very effective mentality when we know our limits. This can be one of the most valuable tools that an athlete can have in knowing their limits. You must take time to learn your body, and know when you are just merely “in pain”, or if you are “injured”. When you have given it your all in the weight room, or on the field for that matter, and you have some muscle soreness or pain, this can be a rewarding feeling that most athletes experience on a pretty consistent basis. The tricky part is being able to tell when that pain is already or is becoming an injury. Unfortunately there is no black or white answer to this question, the athlete must know their body, and know whether or not it is safe to push on. A sign to look for if you think your pain might actually be an injury may be progression of the pain. If you are trying to play through the pain, and you notice the pain is getting significantly worse, you may be injured. If you are feeling pain after hearing a snap or a pop in your body, you may be injured. If your pain is preventing you from playing at “full-speed” you may be injured, and most certainly are very likely to become injured if you are not already. If you notice substantial swelling in an area, you may be injured. If you feel/hear grinding in a joint, you may be injured. This is by no means an all-inclusive list, but just some things to look for if you think it is more than just pain. The general rule is that if you are just in pain, you can probably continue to play (if you can go full-speed.) If you suspect any sign of an injury, you need to STOP playing immediately and address the issue. Making the wrong decision at this point can cost you many weeks of your season, and in some cases may cost you your career. So be SMART and listen to your body. If you just do not know the answer, STOP playing and get a professional medical opinion. After an injury, treatment can often begin with Rest, Ice, Compression and Elevation (RICE), but it is always advised to see a professional to get back on the field faster! Chiropractic offers a balanced approach to the treatment and healing of sports injuries. Passive soft tissue therapy is used on muscles, tendons and ligaments to decrease inflammation and return the supporting tissues back to normal function. A chiropractic adjustment is used to return spinal segments to their normal mobility and facilitate the healing process by allowing the nervous system to function at the optimal level. Chiropractors can also discuss better strategies for exercise and stretching to help an athlete stay on the proper path to excel. Many professional athletes are utilizing chiropractic care because it helps them maximize athletic performance. 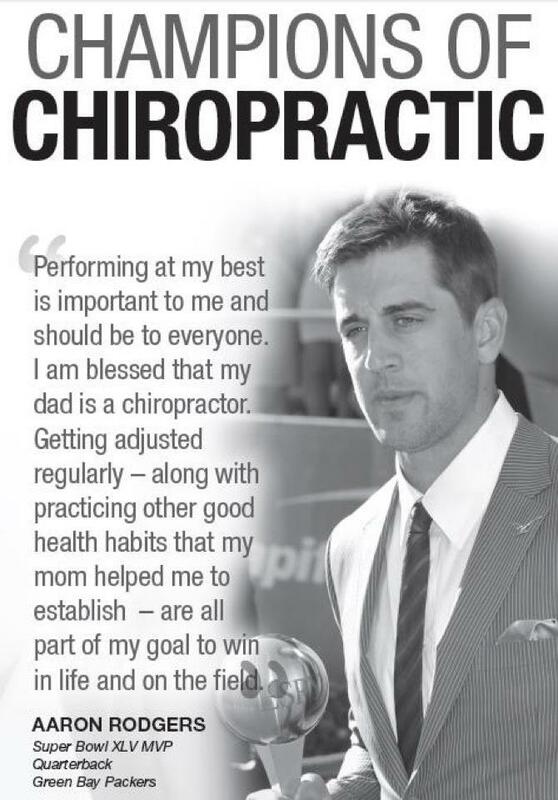 Articles continue to appear citing such stars as Arnold Schwarzenegger, Evander Holyfield, Emmitt Smith, Joe Montana and most recently Aaron Rodgers (whose father is a chiropractor) proclaiming the benefits that chiropractic has meant to their careers. More and more professional and college teams are utilizing chiropractic care for that same reason. If you can remember that the whole premise of chiropractic health is to restore spinal health so that the body has the best opportunity to maximize proper function, it is not hard to understand why the pros enjoy what chiropractic has to offer.